Readers who follow our Facebook page have perhaps noticed that it was a bit silent on the streets during the previous week. The season of the festivals has passed and many artists are busy preparing their exhibitions. Some of them you should definitely check out like JR’s exhibit at Lazarides London or two interesting group shows by graffiti artists like More Than Words in New York and Who’s Your Daddy? exhibition in Lausanne, Switzerland. 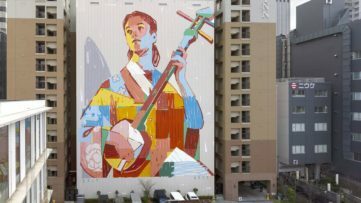 This week was also marked by the creation of Shepard Fairey’s widest mural and MadC’s mural painting in Dortmund which was chronicled in MadC’s diary, along with her engagement in a mural book publication. We also discussed the evolution of street art practices with Kestin Cornwall in our podcast series, so be sure to check that as well. 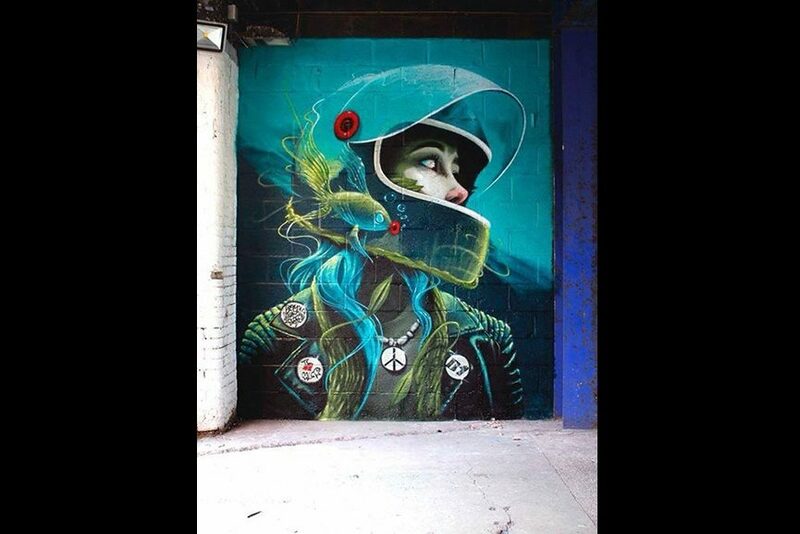 Sheffield-based artist Rocket01 recently visited Manchester, where he painted one of his signature pieces. 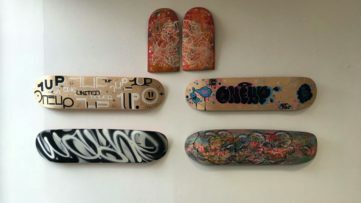 Except his graffiti and street art practice, Rocket01 works in fine arts as well, and in the past he did a great amount of commission works locally and internationally. He often collaborates with Fauna Graphic and his style can be defined as an interesting mixture of organic and futuristic imagery. Punk iconography is also one of the main features in Rocket01’s work and this latest piece incorporates all of his recognizable motifs. The piece was done for the Wellington House Art Jam which starts this week. 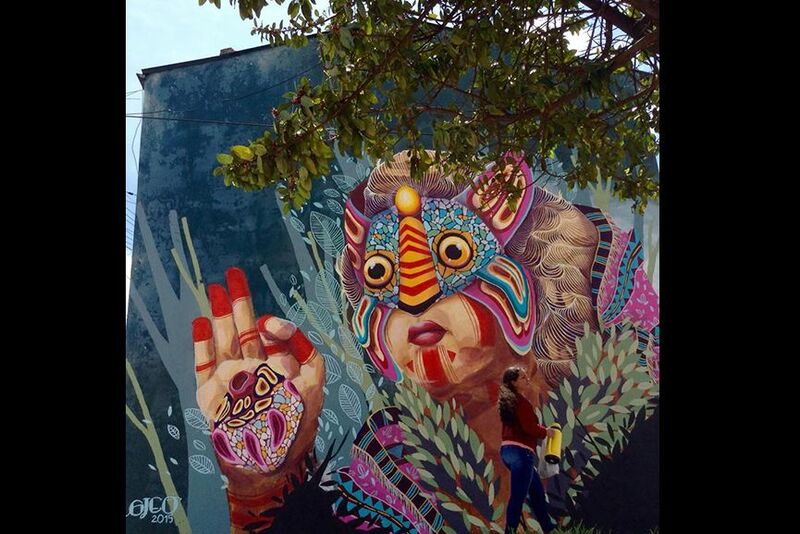 Columbian street artist Gleo finished yet another of her pieces in the streets of Bogota. 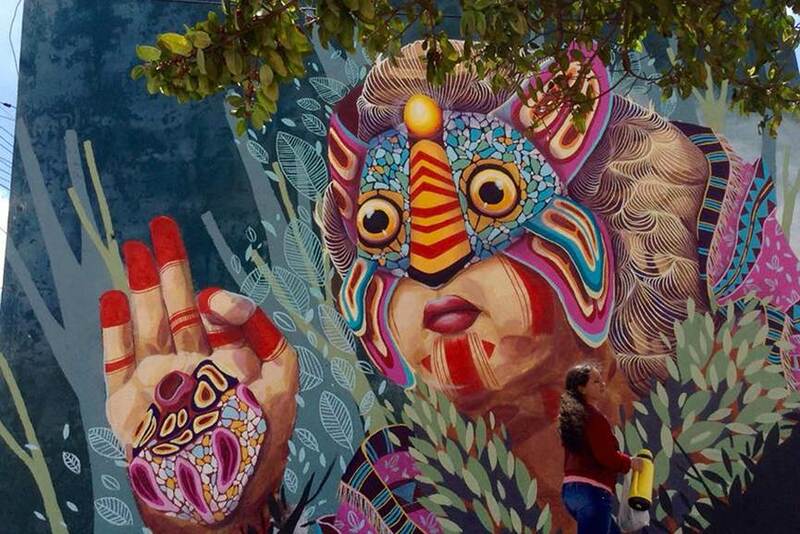 Known for her vibrant and colorful street art works, Gleo brought to life a female character wearing a mask inspired by animal motifs, done in the artist’s signature style. Entitled Corazón Coraza or the Heart Shell the piece shows Gleo’s meticulous skills and her high orientation towards the details. Imaginative and playful, the recent work of the artist is an admirable contribution to the Ciudad Bolivar district and the city in general. 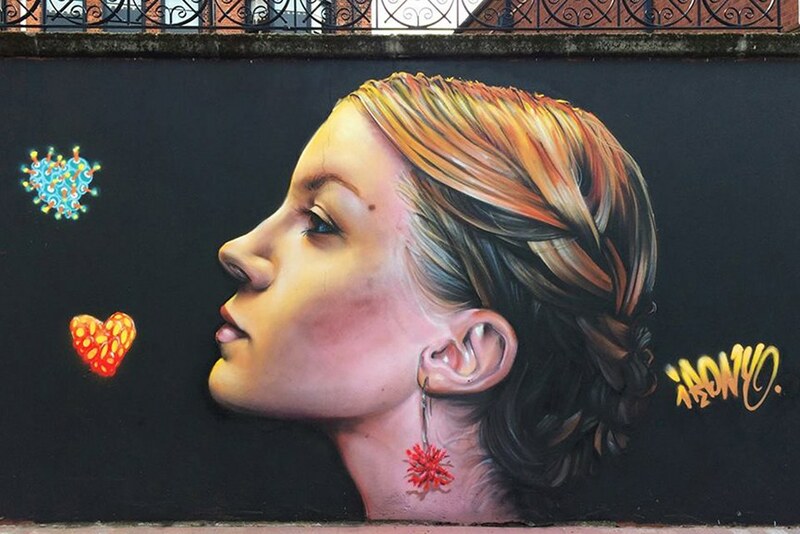 French artist Brusk was one of the participants in this year’s Art Rua Urban Art Festival which celebrated its fifth anniversary. Parallel to Art Rio, the festival is one of the biggest urban art events in Rio de Janeiro and Brusk’s piece was definitely one of the highlights. 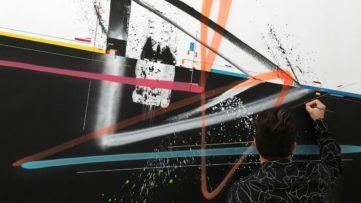 The work of the French artist is often based on the experimentation with different mediums from street art and graffiti to photography and mixed-media works. 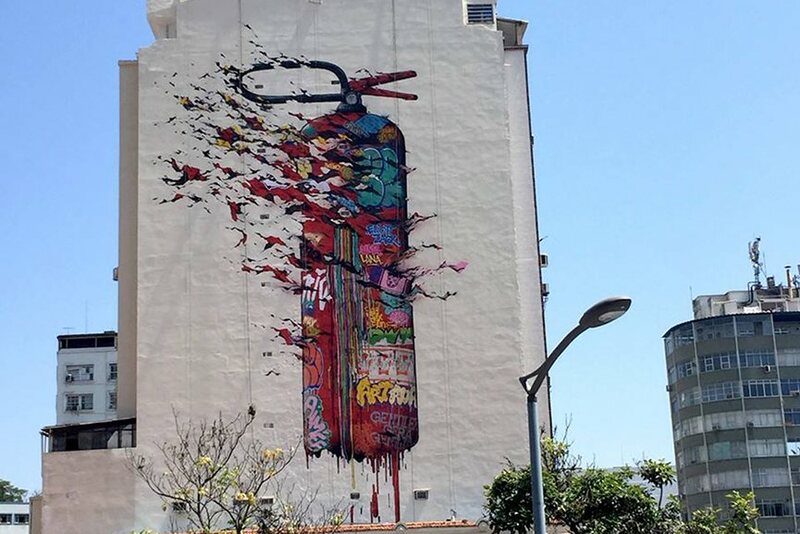 This time, his large-scale piece in Brazil brings the classical graffiti inspiration in form of a fire distinguisher covered with old-school tags on the one side and dissolving on the other. Is Brusk making a statement about today’s graffiti scene? We’ll let you decide. UK street artist Irony finished his work on one of the walls in Belfast earlier this week. This time he painted a highly detailed portrait of a young woman. The piece is made in hyper-realistic style, recognizable for Irony’s practice. Except from it being a true celebration of beauty it is also an amazing contribution to the Hit the North program, one of the events dedicated to street art practices within the framework of the annual Culture Night festival in Belfast. Photo via Irony paints on things. Another great artist took a trip to Northern Ireland last week. 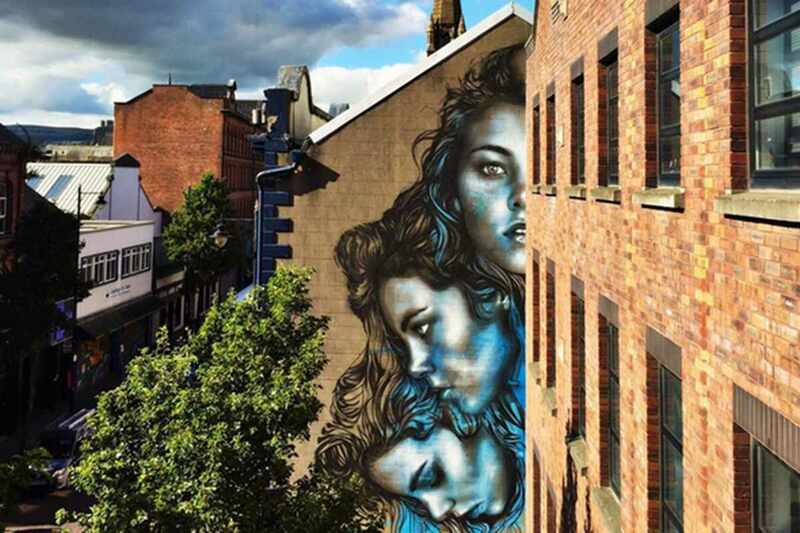 Christina Angelina, one of the leading female muralists was also in Belfast for the Culture Night festival where she painted an amazing large-scale mural. Christina Angelina’s public works are often very similar in the choice of main theme and technique, but always surprisingly new and beautiful. In her signature blue color Angelina painted a portrait of a woman from three different angles, using only ladders and showing once again how dedicated she is to her work. Sign up for My Widewalls profile for FREE and enjoy new works as soon as they appear on the streets!